"A favorite side dish for Italian meals that is hearty enough to stand alone as a vegetarian main dish. Can be served warm or chilled for later." Bring a large pot of lightly salted water to a boil. Cook orzo in the boiling water, stirring occasionally until cooked through but firm to the bite, about 11 minutes. Drain. 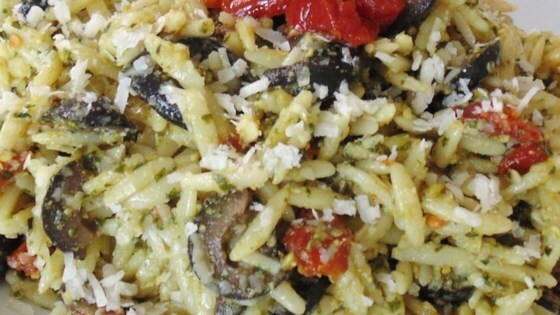 Mix orzo pasta, tomatoes, and olives together in a large bowl. Pour pesto over pasta mixture and stir to coat. Sprinkle Parmesan cheese over the pasta mixture; stir. Drizzle olive oil over the salad and stir to achieve your preferred moisture level. See how to make easy gnocchi with savory smoked sausage. Plum tomatoes can be used in place of sundried tomatoes. Use any black olives you wish in place of Kalamatas. It was ok. My older son liked it a lot, but I probably won't be making it again. Just not my taste. I left out the olives and I revised the recipe to accommodate the needs of my family. I doubled some ingredients and lessened others. The pesto and the parmesan cheese make this dish. Pretty amazing. I cut up all the olives and tomatoes along with adding chicken. Yummy! I thought this was a great combination of flavors. Next time I'll slice the olives in halves. This was excellent. Unfortunately I didn't notice that it only made two servings. I will make it again soon and double the recipe.